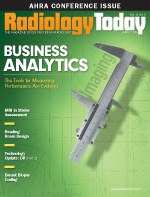 Editor’s Note: In the second part of two-part our direct DR technology update, four manufacturers add their observations about current market trends, including improved image quality, increased efficiency, workflow enhancement, accelerated digitization, dose reduction, cost optimization, retrofitting, increased system mobility, and automation. They also provide an overview of their latest products. Industry acceptance of direct DR technology is increasing faster than anyone thought it would, says George Curley, Agfa HealthCare’s senior marketing manager. “More players have entered the DR marketplace in the past two years, especially the ones whose manufacturing capabilities lend themselves to the market,” he says. This past spring, Konica Minolta announced that it has expanded its DR retrofit distribution agreement with GE Healthcare. This agreement involves selling Konica Minolta’s AeroDR wireless panel as a digital upgrade solution for the GE Optima XR200amx mobile X-ray system. The distribution agreement continues an alliance that the two companies formed in 2013 to provide hospitals more choices for upgrading to digital wireless solutions. Konica Minolta deploys a carbon fiber unibody design that, Eisner says, wraps around the panel like the fuselage of an airplane. “The wraparound design makes it more stress, strain, and liquid resistant so it can absorb more impact and bending forces before there is any real damage. Plus it’s easy to clean because there are no battery compartments,” he adds. For power, the company uses a lithium ion capacitor instead of a lithium ion battery. “This represents a different type of power management technology that doesn’t suffer from the same degradation that a lithium ion battery would,” Eisner says. • The AeroDR Portable Solution is a portable upgrade kit that efficiently turns a currently portable X-ray system into a digital wireless solution. AeroDR wireless digital flat-panel detector systems allow for easy image detector positioning, which improves patient comfort and stress. The imaging console also provides the ability to quality control the X-ray to determine whether another exposure is needed before leaving a patient. The retrofit system was designed for purchasers to quickly, easily, and inexpensively transform their current portable X-ray unit into a digital wireless solution. With its small footprint (384 mm X 384 mm X 72 mm), this self-contained system can be installed and stored inside the cassette storage bin. It’s completely self-contained and includes two long-life batteries. • The ImagePilot Aero combines the ImagePilot workstation with the AeroDR wireless panel. Besides the unibody design, its features include a crystalline cesium iodide scintillator and a lithium capacitor in a 6.4-lb cassette. • The AeroDR 17- X 17-inch flat-panel detector is the newest product in the AeroDR portfolio. With the increased image area, users can limit the need to rotate the panel from portrait to landscape and vice versa in the bucky tray when performing chest or abdominal X-ray procedures. Last year, GE Healthcare completed its Tomosynthesis Lung Nodule Detection Study that compiled data from five institutions across several years. The company found that the technology has 7.5 times greater sensitivity for detecting 4- to 6-mm lung nodules compared with two-view X-ray. “The FDA recently cleared this new indication as part of a 510(k) submission, allowing GE to promote tomosynthesis for lung nodule detection.” Edler says. While specific DT codes have not been established yet, the technology may provide a minimal dose volumetric imaging alternative to CT using radiography equipment. In addition to the new tomosynthesis capabilities, GE’s DR technology offers users two additional applications. One is dual energy subtraction, which acquires low-energy and high-energy versions of an image. “From these two exposures we get a standard X-ray image, and can create both a bone-subtracted image and a soft tissue-subtracted image,” Edler says. In addition to helping remove overlying bone structures, the importance of dual energy images is that they can reveal if an abnormality is calcified, which could indicate whether it is benign or malignant. There is also ongoing research related to the value of using dual energy in helping to detect coronary calcification, says Edler. Agfa offers a full portfolio of DR products that feature its patented third-generation MUSICA image processing software. The Agfa line includes mobile/portable equipment for ICUs, neonatal units, emergency departments and trauma, as well as pediatric applications. It also offers ceiling- and floor-mounted radiography room systems as well DR retrofits for existing equipment. Agfa’s line also offers a common workstation and common image processing across the entire product line, Curley says. Its NX workstation has a user interface identical for CR and DR, which allows easy standardization in an enterprise, facilitates efficient workflow, and minimizes staff training requirements, he adds. Agfa’s DX-D Retrofit package offers the workflow and image quality benefits of DR. The package can be installed on existing X-ray equipment to get customers up and running quickly. In addition to the MUSICA software and NX workstation featured on Agfa’s DR systems, the system includes the choice of cesium iodide or gadolinium oxy-sulphide detector conversion screens. The DX-D 100 mobile DR system is designed to handle a broad range of general X-ray exams and includes both MUSICA and the NX workstation as well as the DX-D 30C wireless detector. The company’s floor-mounted U-arm DX-D 300 system includes a cesium iodide DR detector with motorized positioning, a U-arm allowing lateral cross-table exams on rolling tables, and optional CR compatibility. Agfa’s DX-D 400 offers scalable and affordable floor-mounted DR system with flexible configurations that can be combined with Agfa’s CR systems, providing customers with more versatility. The DX-D 600 is fully automated for the X-ray room. It is a two-detector, high-throughput general radiography system with manual, semiautomatic, and fully automatic configurations. It includes a cesium iodide detector, MUSICA, the NX workstation, and DICOM connectivity to PACS and HIS/RIS and can be integrated with Agfa’s CR systems. Agfa’s latest digital detectors include the cesium iodide or gadolinium oxy-sulphide detector conversion screens and connectivity to PACS, HIS/RIS, and images. Small pixel size provides users with more image information. The detectors include the DX-D 10 (43 X 35 cm), DX-D 20 (43 X 35 cm with handle), DX-D 30C (46 X 38 cm wireless), and DX-D 35 C (38 X 31 cm wireless). Fujifilm’s FDR Go is its latest DR mobile X-ray system designed with features that X-ray technologists like, Fabrizio says, which is important because technologists help drive the purchasing decisions with their preference for mobile systems. The system is available with 17- X 17-inch, 17- X 14-inch, and 24- X 30-cm detectors. The FDR Go uses the same intuitive interface as the company’s digital X-ray console products. FDR D-EVO, a 6-lb, 14- X 17-inch detector, can provide a smooth transition to digital X-ray. The cassette will fit in a standard bucky and provides an easy retrofit to existing analog rooms. Other features include five-second preview and 10-second cycle times and Fujifilm’s patented ISS technology, which positions the capture electronics at the tops of crystals, where data are the strongest and sharpest to reduce scatter and blur, according to the company. Fujifilm’s Dynamic Visualization image processing automatically improves visibility of the entire exposure field, clarifying over- and underpenetrated regions and enhancing and optimizing visibility for region of interest, according to the company. FDR-flex is a portable FDR D-EVO detector system in a briefcase size, which allows users instant conversion of analog portables and analog rooms to DR without any wired connections. FDR Go2-flex is a hybrid DR/CR mobile unit that combines the flexibility of D-EVO DR and CR detectors in an integrated transportable system. The FDR D-EVO Portable Upgrade System is an integrated upgrade system that transforms GE Healthcare AMX4 and 4+ analog portables to DR.
Fujifilm also offers the FDR AcSelerate Suite, a fully integrated dual-detector DR system designed to be a complete radiographic room replacement solution. With fully automated X-ray equipment, the suite enables faster patient positioning and exam preparation. Components include the AcSelerate upright chest stand, the AcSelerate table, and a ceiling mounted X-ray tube. All dual-detector suites feature Fujifilm’s exclusive SpeedLink X-ray Control Software, which fully automates and optimizes exposure settings, exam technique, and processing algorithms based on anatomic exam and series type selected at the FDX console.